This is the OVW Report for Wednesday, May 29, 2013. 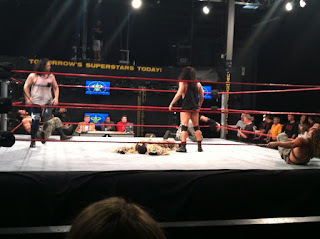 This episode can be seen online starting tomorrow at www.ovwrestling.com/tv. In this final episode before the next Saturday Night Special on June 1st, we have a special interview with Michael Hayes & Mohamad Ali Vaez, a triple threat match featuring OVW Heavyweight Champion Jamin Olivencia, #1 contender Jessie Godderz, and Jay Bradley, Trina defends the Women's Title against Epiphany in a rematch from the previous SNS, Randy Royal has another TV Title defense, plus much more! Flash Flanagan vs. "Mysterious" Cody Castle. Flash offers Castle a chance to leave before the match starts. Flash takes him down and hammers him across the back. He throws him off the ropes and backflips him, but Castle lands on his feet, jumps off the ropes and hits a body press for 2. Flash take back control and hammers him in the corner and delivers a loud chop to the chest. Flash with a big spinebuster. He throws Castle in the corner and charges, but Castle jumps up and hooks him with a headscissors. Flash pops right back up, however, and delivers another big chop and places him in a headlock. Castle rolls out and rolls Flash up for 1. Flash chops him again and hits the flying neckbreaker for the win. MY TAKE: The veteran Flash continues to show the young talent how to win. Lovely Lylah vs. Lei'd Tapa. Lylah shoves Tapa, and Tapa shoves her back. Lylah runs off the ropes and runs into Tapa, but bounces off of her. Tapa throws Lylah in the corner and charges, but Lylah moves. She mounts Tapa and begins to punch her, but Tapa grabs her and powerbombs her. She starts the pin, but breaks it, and decides to deliver more punishment. Tapa kicks Lylah and places her in a headlock. She throws Lylah into the ropes and hits a big clothesline. Lylah tries to fire back with some forearm shots, and tries to roll Tapa up, but Tapa holds the ropes. She grabs Lylah and hits her spinning diamond cutter finisher for 3. MY TAKE: Another impressive win from "The Queen". She yells out to bow down to her, and soon, all the Femme Fatales may be doing just that. 4M: "Mister Marvelous" Melvin Maximus vs. "The Welsh Colossus" Rob Terry. 4M poses in the corner, then Terry does the same and gets a louder reaction. They repeat this again, but 4M tries to attack the second time. Rob jumps out of the way, and 4M runs into the turnbuckle. Rob then climbs the ropes and stands on 4M's back to pose again. They then do a test of strength that Rob is winning, until 4M bites his fingers. 4M hammers Terry across the back and forearms his chest. Terry reverses a throw into the corner and splashes 4M. He hits his finisher and gets the 3. MY TAKE: Big Rob takes down another big man and continues to dominate. That concludes tonight's pre-show dark matches. I always recommend watching the episode first on TV or online before reading the rest of the report. Again, you can check it out on OVW's official website late Thursday afternoon/evening at www.ovwrestling.com/tv and on WBNA ion-21 in the Louisville area Saturdays at 12 noon with replays Wednesdays at 9PM after WWE Main Event. We see a Coalition meeting where they say their backs are against the wall, but they can't let the civilians win and must kill and teach them a lesson tonight. "Strongest Gamer Alive" Marcus Anthony vs. Adam Revolver. Marcus thwarts off most of Adam's offense. He hits some big shots and a power slam. He misses a knee drop, and Adam kicks his knee and hits it against the ringpost. Adam goes up top and hits a flying body press, but Marcus kicks out. Marcus catches Adam in his suplex into a slam finisher for 3. MY TAKE: Marcus dominates again and it would be wise to stay out of his path of destruction. Taeler is talking to Nikki St. John and it was hard to hear, but it appeared that Taeler & Nikki were working together to bring Heidi to their side, and were setting something up. We then see Jay Bradley arguing with Jessie Godderz about stealing his title shot. Jessie said anyone could sign that contract, except for Jay, and you can call him "Mr. Opportunity". Jamin Olivencia walks in and says they think they're so tough, but he can beat both of them and how about a 3-way match later tonight. 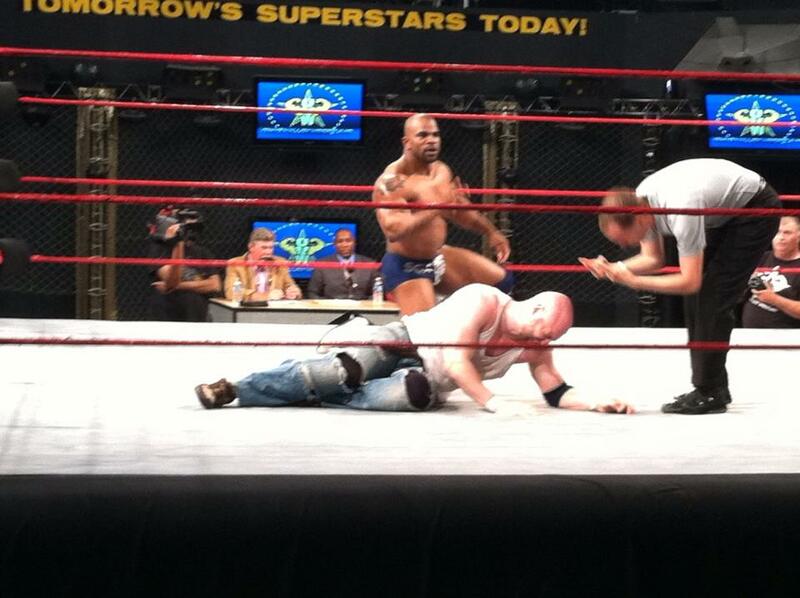 Tony Gunn is then seen talking to Randy Royal about Randy throwing Dylan Bostic over the top rope last week. Royal says it was a fluke and tells Gunn he is taking care of business and to trust him. They bump fists. We then see Heidi approach Taeler & Nikki. Taeler tells Heidi that Trina has been saying things behind her back about her & Taeler. Back in the ring, the now not-so-mysterious Cody Castle is cleaning off the ring ropes when the lights go out. When they come on, he is taken out by the big clothesline from the Assassin. OVW WOMEN'S TITLE: Epiphany (w/Eddie Diamond & Timmy Danger) vs. Trina (c). Epiphany kicks Trina and then does a headlock takedown. Epiphany with a slam and a powerslam, followed by a splash in the corner. She only gets 2. Trina starts to fire back, but Epiphany kicks her and goes for her finisher, but Trina slides out and hits a faceplant DDT for 3. MY TAKE: Epiphany is too worried about "Diamonds" and not enough about the "gold". In the back, Heidi catches Trina as she comes back through the curtain. She says she's heard about all the stuff she said behind her back and challenges her to a match at SNS for the OVW Women's Title. 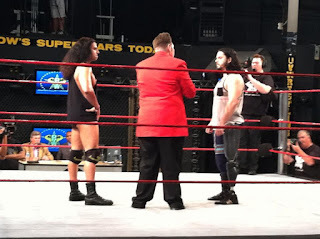 In the ring, Michael Titus interviews Michael Hayes & Mohamad Ali Vaez. Hayes says many people were confused as to why he would pick Ali as his partner. He says Ali is a former 8-time TV champion, he helped him learn what it's like to be a professional wrestler, and he stepped up for OVW when Josie tried to make him lose his chance at becoming TV champion to take over power. Ali says he has had a lot of time to think while he was on vacation. He says his parents came to the U.S.A. 38 years ago for a better life and a dream. He also says that when he was 18, he joined the Army and spent 4 years at West Point. He says the Coalition have been wrong in what they are doing. 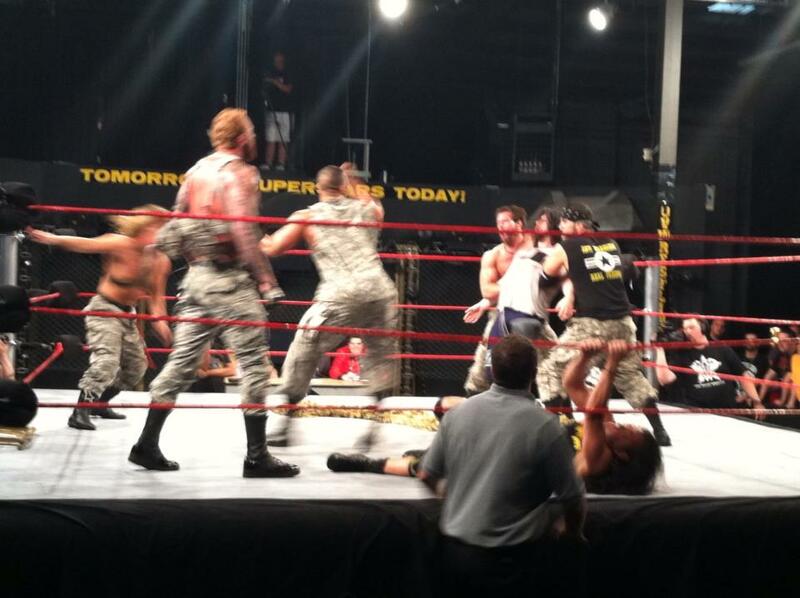 Delta Team Bravo, Ghillie Man, & Joe Coleman roll out from underneath the ring and attack Hayes & Ali from behind. Ali & Hayes fight back and chase them out the side door. OVW TELEVISION TITLE: Paredyse vs. "The Double R Superstar" Randy Royal (w/Tony Gunn) [c]. Paredyse runs at Royal, but Royal kicks him and delivers a knee to the face. Paredyse hits Royal in the corner, but Royal catches him and slams him. Paredyse hits Royal's knee and works it over. He hits a bronco buster, but Royal rolls him up for 2. He tries another small package for 2. Paredyse catches him with a clothesline and gouges his eyes. He misses a fist drop off the second rope. Royal hits a reverse russian leg sweep, backflips Paredyse, and pancakes him. Paredyse comes back and hits Royal in the corner. He goes for another bronco buster, but Royal lifts his leg up and kicks Paredyse below the belt. He rolls Paredyse up for 3. WINNER and STILL OVW TV CHAMPION: ROYAL by pinfall. After the match, Rockstar Spud comes out and says Royal's not fooling anyone with his cheap shots. He says he will meet him again at Saturday Night Special, and he's not demanding, he's instructing Tony Gunn to stay out of their match. MY TAKE: Was that kick below the belt self-defense, or a cheap shot? Will Tony stay out of the match at SNS between Royal & Spud? "Lonesome" Jay Bradley vs. "Mr. Pec-Tacular" Jessie Godderz vs. Jamin Olivencia. A lot of back and forth in the beginning between the 3. Jay hits Jamin, and hits a big boot. As he dusts off his boot, Jessie tries to steal a pin. Jay kicks Jamin, Jamin kicks him back, punches, and ducks a clothesline from Jessie. He hits a jumping knee to Jessie's head. He throws Jay in the corner and then throws Jessie into him. He charges, but they both move. Jamin jumps up on the ropes and hits a double dropkick. He slams Jessie twice and dropkicks Jay. He then leaps out of the ring on to Jessie on the floor. Jay is back up and clubs Jamin from behind. He locks in a headlock and hits Jamin across the back, and then throws Jessie back out of the ring after he tried to sneak up on him. He tries to pin Jamin for 2. He locks Jamin in a sleeper, but Jessie dropkicks Jay and then takes out Jamin's knee and tries to pin for 2. He locks Jamin in a legscissors and a sleeper. Jamin gets up and slings him off, but Jessie jumps back on his back. Jamin rams him into the corner to break the hold. He hits the kamikaze splash. Jay sneaks in behind Jamin and goes for the Boomstick, but Jamin reverses it into a roll up for 2. Jay comes back and hits Jamin with a big backdrop. Jay charges Jamin, but Jessie catches Jay with a powerslam. Jamin tries to drop toehold Jay, and Jessie bulldogs Jay to take him down. Jessie catches Jamin with a diamond cutter for 3. 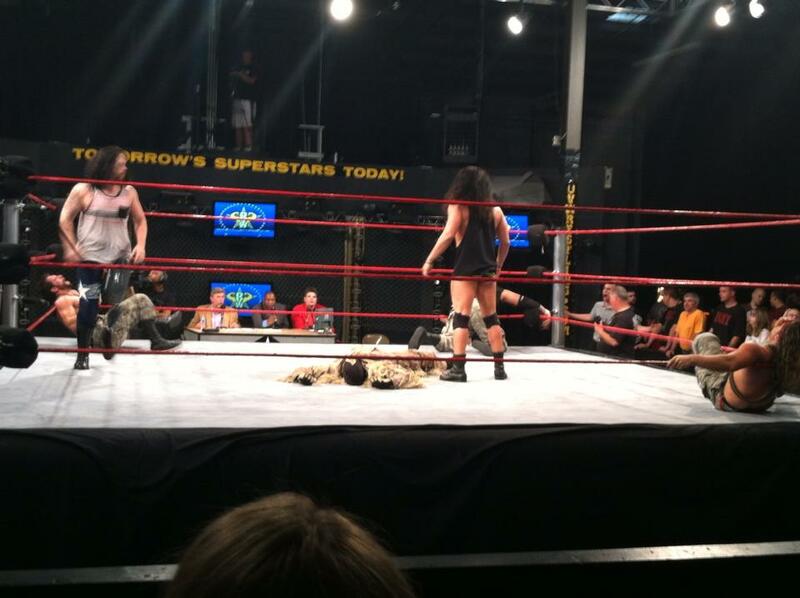 After the match, Hayes & Ali drag out Ghillie, Coleman, & Delta Team Bravo. They call out Crimson & Jason Wayne. They also come out from under the ring with gas masks on, and attack Hayes & Ali from behind. They hit them with a chair and a baton and tie Ali's hands up behind his back and handcuff Hayes to the ropes. MY TAKE: Can Jessie perform a "Pectacular" feat and pin Jamin again to become the new champion? Will the "Real American Heroes" be good to go against the Coalition Generals at SNS? This ended the TV taping. 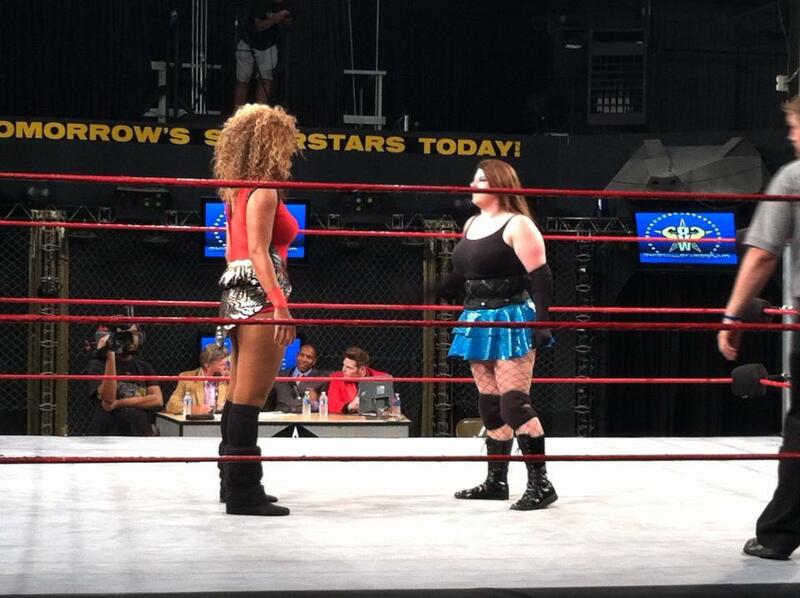 Nikki St. John & Taeler Hendrix vs. Holly & Hannah Blossom. Holly starts with Taeler and Taeler & Nikki take the early advantage. Holly finally gets the hot tag to Hannah. Hannah with a back elbow and a forearm to Nikki. Hannah suplexes Nikki for 2. Taeler & Nikki try to double team Hannah, but Holly grabs Taeler from the outside and pulls her out. Nikki turns around into a Blossom Kick for 3. MY TAKE: Hannah & Holly pick up a win while Taeler & Nikki plot to deceive Heidi & Trina. "The Ken of OVW, Justin Bieber of Professional Wrestling, & King of Pink" Dylan Freak'n Bostic vs. "Off the Wall" Sam Shaw. Shaw takes down Bostic, but Dylan reverses into an armbar. Shaw reverses into an armbar. After a little bit of back and forth, Shaw catches Bostic with a Lou Thesz press. He hits a monkey flip, but tries for a second one, and Dylan grabs him by the hair and pulls him down to the mat. He goes for a legdrop, but Shaw moves. Off the ropes, Bostic goes for a backflip, but Shaw lands on his feet. He hits a dropkick, and finishes Bostic off with Shawshanked for the win. MY TAKE: Shaw continues to win and make a name for himself in OVW and hopes to do the same at TNA Slammiversary against Jay Bradley. Don't forget the next Saturday Night Special is this Saturday, June 1st at the Davis Arena! The card for this weekend's big event will be up tomorrow at 12 Noon.